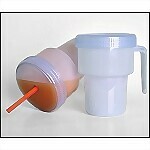 Lightweight spillproof drinking cup that is used with a straw and is ideal for people of all ages. 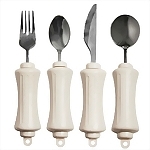 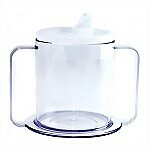 The patented design allows the cup to be easily filled with up to 7 ounces of warm or cold liquid. 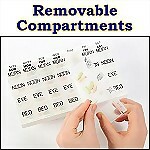 Features 7 individual removable daily pill organizers in an "easy snap" tray and easy to read, raised lettering. 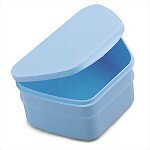 Translucent lid for easy view Size: 9-5/16" x 5-1/4" x 1-1/8"
This scooper bowl provides a high rim and reverse curve on one side to aid in scooping food onto a utensil without spilling. 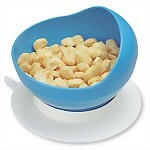 Comes with a non-skid suction cup base. 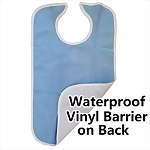 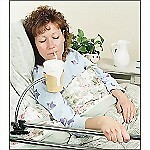 Hemispherical Diameter: 4 1/2"
Helpful in assisting those who have difficulty holding drinks. 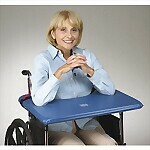 Conveniently clips onto bed frame or wheelchair.